Michelle Mullins is a certified dog trainer and helps develop our Busy Buddy toy line. Choosing the right toys for your dog can help in keeping him on his best behavior. A few good enrichment toys can help with everything from a chew hound, a fast eater, bored or tug happy pooch! I love food/treat dispensing chew and puzzle toys and highly recommend them. They encourage dogs to interact with the toy, they keep dogs busy and appropriately engaged for extended playtime, they can be used to feed the dog’s regular daily portion of food and keep dogs from scarfing their food from a bowl in less than 5 seconds. Our Busy Buddy® Line has a variety of toys to choose from. It provides many choices so you can find the right toys for your dog and his behavior. You will want to consider the age and size of your dog when making a selection. Most toys have age and weight recommendations on the package. 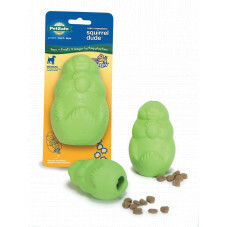 What about picking a toy that will help a voracious chewer, puppy or adult? Puppies should be introduced to toys as early as possible but they don’t even have teeth until three to six weeks of age. So puppies need softer toys to protect gums and baby teeth. Consider dog safe plush toys and puppy lines like Busy Buddy Puppy or Pogo Plush®; at this stage. Dogs have their adult teeth by about six to seven months, having started to lose baby teeth around four months. This teething period can be difficult and you will want to have lots of appropriate chew toys on hand to avoid having your puppy chew up your favorite shoes. Some dogs are still serious chewers into adulthood although thankfully most dogs leave the puppy chewing behind. Providing a variety of appropriate toys to chew can save your couch, shoes, TV remotes, etc. Treat dispensing toys can be a good choice as they encourage the dog to chew the toy instead of something else. I suggest a rubber chew toy for most dogs that love to chew. Not all rubber is the same however. Some hold up better than others to chewing. The thickness of the rubber matters as well, with a thicker rubber being more durable. Nylon toys, like the Bouncy Bone®, can be a good choice and are very durable especially for those dogs who destroy every toy. Plastic food dispensing toys are great for dogs who need more activity in their life. It's also a great pet weight loss tool, because it makes them work for their food. What about your crazy, can’t sit still, scarfs his food dog? Or a couch potato? I love puzzle toys for these dogs! Having a focused activity to do can be just what they need. A puzzle toy can also slow down a fast eater. Our domestic dogs still have some prey drive in them. The act of chasing down a meal and eating it is much more enriching than having a cup of kibble just dumped in a bowl. 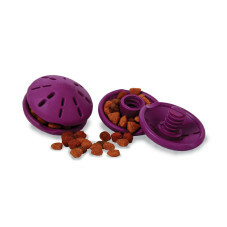 This makes puzzle toys and feeders a great addition to your pet’s mealtime. Having to work a bit to gain a meal also promotes appropriate activity, which our pets often don’t get enough of, and can aid in weight loss. They also help to keep them thinking and learning, which promotes better cognitive health. While you can certainly add a few pungent, extra tasty treats to the puzzles, I suggest you keep those to a minimum as an addition to their regular meal. Simply feed their meals from fun, interactive puzzle toys! A great one to start with for dogs who don’t have much experience with puzzle toys is the Twist ‘n Treat™. The Twist ‘n Treat twists apart allowing for easy loading of food and treats, including dry food, semi moist and moist food. I like to use a smear of yogurt or peanut butter with dry kibble. The toy can be twist together tighter for longer playtime. The Kibble Nibble™, the Tug-a-Jug™ and the Magic Mushroom™ all have a large enough capacity for your dog’s entire meal. These are designed to be used with dry kibble and semi-moist treats. They are designed to keep dogs engaged as they work for their meal and provide extended playtime. As the dog becomes good at getting the food out you can add a golf ball or tennis ball inside the puzzles to make it more challenging. No dog toy is indestructible! If they were truly indestructible they would probably be way too hard and could damage a dog’s teeth. Durable toys are however a much safer and appropriate choice than shoes, cell phones and other valuables! Always supervise your dog with the toy to determine how it holds up to your dog. If the toy becomes damaged replace it with a new toy. I know we want these toys to last forever but dog’s teeth are designed to rip, tear and crush. The best you can do is provide appropriate things for this fun activity and replace them when necessary! What kind of toy does your pet love most? Michelle Mullins is a certified dog trainer for PetSafe® brand. As the Training & Behvaior Education Department Manager, she works to teach people about the best methods of behavior training.